Hooked On Easy Flute 2 is another delightful collection in the ever popular Hooked On series. The 37 all-time-favourite classic titles are arranged to be played in conjunction with the Hooked On Piano series offered by Mayfair Music Publications. 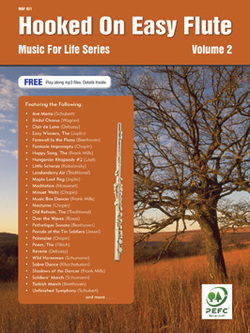 The accompaniment CD makes even the beginning flute player sound professional. Titles include: Ave Maria; Hungarian Rhapsody #2; Londonderry Air; Pathetique Sonata and many more. An ideal study or recreational book.